This segment is presented by Sara Tinsley, a nurse practitioner from the H. Lee Moffitt Cancer Center and Research Institute in Tampa, Florida. She will be reviewing the phase three trial in adults for VYXEOS, the first chemotherapy approved for adults with newly-diagnosed t-AML, therapy-related acute myeloid leukemia or AML-MRC, acute myeloid leukemia with myelodysplasia-related changes. 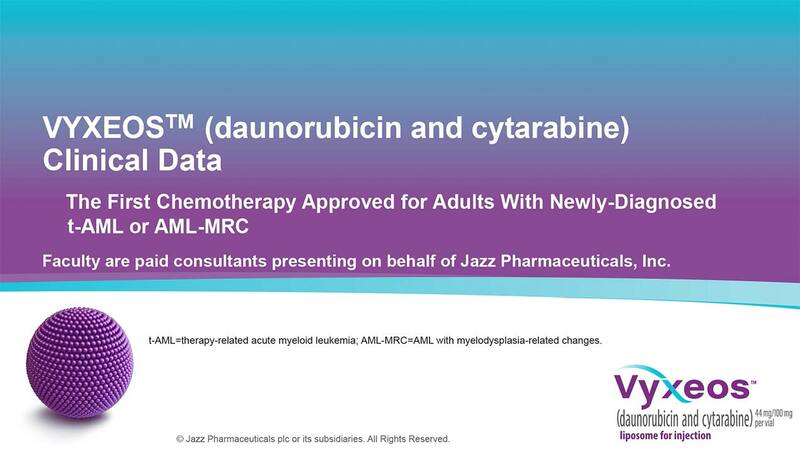 The FDA approval came from this Phase 3, multicenter, open-label trial. We were a part of that. So, I got early experience treating patients with VYXEOS. You may know if you're a trial coordinator, it was CPX351 -- so, that was the name that it was given in the clinical trials. You can see the study schema here. It was comparing patients in this Phase 3 trial, it was adult patients; they had to be 60 to 75 years of age; and remember, the FDA approved this for adults, and they didn't limit it to the 60 to 75 age range. But in this study, this is what the eligibility criteria included. …is 44 milligrams to 100 miligrams per meter squared, and those come in a vial where they're together. And then it was compared to 7 days of cytarabine and 3 days of daunorubicin, our conventional 7+3. So, that's what they were induced with. And then, if they didn't achieve remission, they got a second induction, but the VYXEOS was given on Days 1 and 3, still the 44 milligrams per [sic] 100 milligrams per meter squared. And then, on the alternate arm, it was 5 days of cytarabine and 2 days of daunorubicin. …in overall survival -- that was the endpoint of the trial -- primary endpoint. This illustrates what led to the FDA approval. This is exciting news for our patients. The top line is the VYXEOS survival, which was 9.6 months median survival, compared with 7+3, which was 5.9 months survival. So, that was statistically significant. When your curves separate, that's a difference; so, the VYXEOS was the winner in this case, and that's why we're here talking to you about it. For the Kaplan-Meier estimated 1-year survival, it was 42% for the VYXEOS-treated patients, and only 28% for patients who were treated with 7+3. This is illustrating, again, the percentage of patients who achieved CR. Purple, again, is VYXEOS, 38%, compared to 7+3, which is 26%. And I didn't tell you the numbers -- you can see them at the bottom -- but 58/153 and 41/156. And then the patients who were able to, rate of having a hematopoietic stem cell transplant, 34% in the VYXEOS arm, and 7+3 there was only 25%. And this could be, as many of you are aware, you have to really get a good response to your treatment to be able to proceed to transplant. So, if you're having a better reduction and better treatment of your disease, this slide makes sense to me. And so, the rate of hematopoietic stem cell transplant in first CR was 20% in the VYXEOS arm, and only 12% in the control arm. …"But, wasn't this older people?" Yeah, it was 60 to 75 years of age. So, the ages for transplant keep going up and up -- you know, like, who are they taking to transplant? I just saw a general -- I think he was 78 years old -- still in wonderful health, and he wants to go to transplant. So, at Moffitt they presented his case to see if they thought he was eligible for transplant, and the consensus was, yes, he's healthy enough to go to transplant. So, we're trying to help him meet that goal by getting a deep response. This is a table showing you the safety profile of VYXEOS in the Phase 3 trial. …was 2% of the patients in the VYXEOS arm, and point 7 in the control arm. And you can see the different side effects or adverse events in this table. Many of them are similar to adverse -- side effects that we see with 7+3 -- very similar. And this is more of them. Fatigue, we all know -- that's our number one problem that patients report to us. …with prolonged thrombocytopenia and prolonged neutropenia. And you can see the median days were 49 vs. 44 for thrombocytopenia, and prolonged neutropenia at 44 vs. 35. …the primary endpoint of the trial. The 30-day all-cause mortality was similar, well, overall mortality was higher in the 7+3, but similar in the VYXEOS and the 7+3 arm, 6% each; and the 60-day all-cause mortality you can see is clearly the 7+3 at 21% vs. 14%. Fatal adverse events are what we see with patients with AML that are getting induction -- infection, CNS hemorrhage, and respiratory failure.